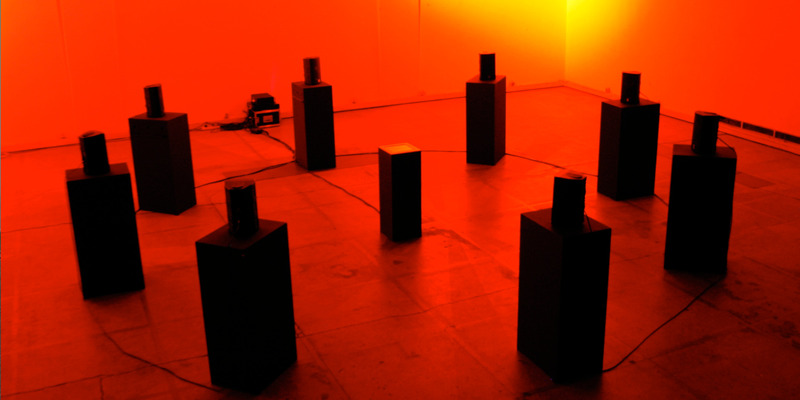 [ 0 ] A ring of eight speakers, pointing inwards to a central monolith. The monolith, one meter high, the surface a matrix of red glowing buttons. 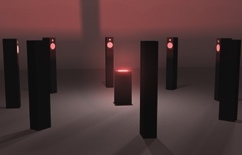 [ I ] If no one touches the monolith for a while, the ring of speakers emits distant ambient noises, making visitors curious to come closer and experience what's happen in the centre. 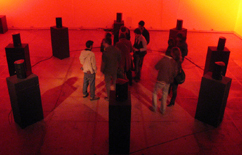 [ II ] First touches trigger percussive elements, mapped to the speakers. Simple, straight interaction that can be understood by any visitor. [ III ] If occupation with the monolith continues for some time, the sculpture becomes more alive. Elements that are defined by pressing buttons on the matrix, spin around, rotating through the ring of speakers while volume and sonic complexity increases. 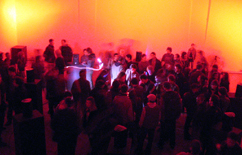 Visitors can create dramatic rotating rhythmical patterns embeded in a constantly evolving wall of sound. [ IV ] If no one plays for a while, the patterns will thin out till there is only the remaining background sounds, echoes from what the visitor achived before, leaving a mark in time, till the next visitor starts to interact [ I ]. Cyclone combines interface strategies derived from the Atlantic Waves and Linear Grid installations, with sonic elements of the Studies for Thunder multichannel performance, and new material, to create a dramatic and highly immersive interactive installation. Cyclone is realised using MAX/MSP. 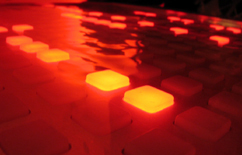 The interface matrix is a custom build Monome surface with 16x16 red illuminated buttons.